Bobby faced a lot of adversity when he first began to train but he pushed himself to success. Read on to see how Bobby overcame his obstacles and picked up a sponsorship. I was diagnosed with Crohn's disease when I was 12. Due to the awful disease I was always underweight and small for my age, so I have always wanted to be bigger. At first I was clueless; I had no kind of structure to my diet. Guess what, I didn't see results. 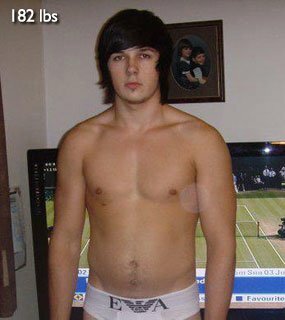 When I was 16 I decided to get a bit more serious, I began reading forums such as Bodybuilding.com, reading articles and soaking as much information as I could. I then knew what I had to do to see results. But even though I knew, I was lazy and never stuck to a strict diet. Earlier this year, I saw that PhD Nutrition was running a cover model competition. An opportunity of a life time, the winner was to receive £1,000 of supplements, an athlete's contract with Ph.D. and also to be featured in various men's health/fitness magazines! It was the perfect opportunity, a goal I can aim for. I decided to enter. Just last week I was notified that I had won the competition! I was against a lot of tough competition, who were all worthy winners. I knew what I had to do to see results. It was a 12-week competition. The before and after pictures were taken 12 weeks apart (with date proof!) My supplement usage (below) will give you an idea of the supplements I used. BCAA's were something new which I added. As I was cutting, I wanted to preserve as much muscle as possible and with all of the studies about the advantages of BCAA's and that they contain zero calories it was a great addition to my stack! I stayed strict for the full 12 weeks, and also cut out alcohol. I let myself have a cheat meal each week; it could be anything I wanted. I usually opted for a huge grill, with 2 starters and a massive calorie-filled dessert! I looked forward to my cheat meal, and I suggest anyone who does a cut to treat themselves to one each week. Not only is it thought to help improve your metabolism and take you out of a plateau, it's also great for you mentally as its nice treat each week! I looked forward to my cheat meal, and I suggest anyone who does a cut to treat themselves to one each week. My training changed hugely, not necessarily the exercises but the way I lifted. I always had good form, but I never connected with the muscle. I counted the reps, instead of making the reps count! Don't just focus on getting from A to B on a lift, really feel it and connect with your muscle to make the rep count. I am not too sure about the future; my contract with Ph.D. will start in 2012. I will be doing a photo shoot at the end of November for 'Demand Perfection' which will be included in a variety of men's health/fitness magazines. This means I have to stay lean! I am hoping to compete in a natural physique competition next summer too! I would really like to get more experience in fitness and commercial modeling, and this competition gave me a great stepping stone! "Do what you've always done and you'll get what you've always gotten"
Do not make up excuses for yourself. Excuses as to why you can't train or why you may miss a meal. Nobody else cares; you're doing it for you. You are just lying to yourself! If you find yourself in a situation, such as you're tempted to order a pizza from the takeaway, just think, is that pizza worth my goal? If you order that pizza maybe you don't want that dream body as much as you thought you did. Keep structure to your training. Keep a log book. Progress! When I go to the gym I can look at my log book, know exactly what exercise I'm doing, what weight I lifted last week and what I'm aiming for this week! It's great for motivation too, every time I go to the gym I'm aiming to beat myself last week! I enjoy lifting weights, but that's just one hour a few times a week. It's the other 23 hours in the day which count just as much, which most people fail on. You're wasting your time in the gym if you're not eating right outside of the gym. For those with medical conditions such as Crohn's, I was fed up of been told what I can do and what I can't. What's possible, and what's not. Crohn's is an incurable disease, but with my new active life style with correct nutrition I am symptom free, and I feel great! Don't let it control you, but the other way around. This is your life, so you live your life, how you want to! You are doing this for you. Nobody else.